Suddenly this season has a bit of pressure. Expectations were raised by the solid first six games. Last week's mess has people wondering if BC can get to bowl eligibility. In a way this Virginia Tech team is the perfect opponent now. They are favored and will still be a tough game, but their offense is so sluggish even a loss will probably be close and not crushing like last week. Many professional circles feel like a "small world" but college coaching really is small. Take Virginia Tech Offensive Coordinator Scot Loeffler as an example. After working with Addazio at Florida, he took the OC job at Temple in 2011. The success he and Addazio had opened the door for him to be OC at Auburn. Addazio filled the Temple job with Ryan Day. While the 2012 season wasn't as successful for Temple as the prior year, Day's BC background did help Addazio and his transition to the BC job. Loeffler along with the other coordinators at Auburn was out of a job when Chizik was fired. Now he's coaching at VT and going against his old boss. 1. Finish the drill against Logan. The Florida State game turned when we didn't wrap up Winston on his bomb before the half. Logan is like that...only bigger. I don't think he is a good QB, but he can capitalize on broken plays. BC needs to take him down when we get the chance. 2. Improve field position. Last week we didn't do the offense any favors by starting so many drives deep in our own territory. That needs to change this week. I don't expect Dudeck to break any big punts, but he needs to do little things to help the net punting. Willis also needs to come out strong on his KR. 3. Play action pass. It is the only way we are going to get them out of crowding the box. The guys are getting open. We just need Rettig to get them the ball and for them to hold on to it. -- Addazio is 3-1 at home this year. This will be the sixth BC Coach Frank Beamer has faced. With the way colleges churn their coaches, I doubt we will see another rival coach put in 25+ years against us. From an ACC standpoint, the game is FSU-Miami. As a barometer of what BC faces, I think Wake-Syracuse is much more important. Wake has improved since we played them and the Orange are faltering. One of the younger guys step up. Spiffy is our first big injury of the year, but that should be an opportunity for one of the other player makers to fill his spot. Dudeck will probably get more passes his way, but why can't Jackson or Crimmins or one of the other guys make some plays? Rettig doesn't get out of his malaise. By this I mean that he completes more than 50% of his passes, doesn't turn the ball over and doesn't take more than three sacks. That's a lot to ask against this defense, but it is the only way BC is going to win. It feels like the UNC loss emptied the bandwagon a bit. I realize we have serious problems, but I remain upbeat about this matchup. Despite their defense and talent, Virginia Tech has not played very well this year. I think it will be low scoring and BC will make fewer mistakes. I think Chase breaks out of his funk and we take the lead in the second half. It is a few days old, but there was some good news out of the BC's private scrimmage with St. Joseph's. Although we trailed when it was starters vs starters, BC won the event and made 14 3-pointers. That type of output should be very exciting. If it is a sample of our mindset we are going to cause every team we play problems. I know chucking 3s is not foolproof. However, if teams clamp down on us, we know Hanlan can penetrate and score at the basket. It should also open up things for Anderson. Maybe this really is Donahue's chance to go "all in." We've got a super tough schedule and an experienced team and an AD who didn't hire him. Why not try to shoot the lights out every night? What's the worse thing that could happen? One rotation guy who is not a shooter is freshman Garland Owens. BC's been a bad defensive team for a long time now. Having one good energy/defensive wing like Owens is not going to change that. But as long as Owens can help slow down the other team's best player, we can go without his offense. I always seem to come back around to Dennis Clifford, but he's still such an unknown. When thinking about Darryl Hicks' likely redshirt, I started thinking that a Clifford redshirt is probably a good idea too. This team has an effective big man in Magarity. It looks like we will have enough depth and offense and we know Clifford is not going to be healthy enough to start the season. Instead of rushing him back, why not let him sit the whole season and get 100% healthy. It is a move that would certainly benefit Dennis. He could recuperate and hopefully regain his old form. It think it would also help our scholarship distribution. A healthy 5th year Clifford could lead a team after the departure of Anderson and Jackson and others. The only drawback is losing him in this critical season. I am not doctor or basketball coach, so this may be premature or plain dumb (probably both). I just think sitting him is the best long-term decision for Clifford and Donahue. Chase Rettig is coming off one of his worst games and we are facing (in Addazio's mind) the best defense we've faced this year. It doesn't appear like a great time to bounce back or regain your confidence. I don't know exactly what is going on with Rettig. He's always held the ball a bit too long, but now it is becoming a real problem. Is it the new offense? Is it a lack of faith in his receivers? Is he being coached to hold on rather than force a pass? Has he lost his confidence? Or are not enough guys getting open? Based on watching and on what Addazio said, I think it is probably a little bit of everything. The most challenging part of this slump is that Rettig still represents our best chance of going bowling. We know he can get hot. We know there are winnable games left. And the alternatives are not better. This is not Porter-Ryan or even Shinskie-Rettig. It is much more equivalent to Crane-Davis. The backups can't do the one thing that Chase can -- throw the ball. The answer is to make the game easier for Rettig within the confines of the offense. To do that, Rettig needs to do the one thing that against his nature -- run. We don't have a pages and pages of the playbook dedicated to QB runs like we will next year. But there are still plenty of plays where there are running opportunities. There are a few options and plenty of rollouts. Either by nature or by coaching, Chase rarely runs in those plays. However, there is plenty of open space. Early in one of our drives, he handed it to Williams on an option play when he could have kept it for a big gain into huge hole. Some of his rollouts (if he stays close to the line) could go for positive yardage. The biggest area where he could benefit from the run, is scrambling forward from the pocket when no one is open. The opponents are not spying him. On many of these plays he could escape for short gains. I don't think Rettig is ever going to look great running or break open the game. Running has its risks. Rettig could get hurt, but I think the upside of running outweighs the risk of injury. Right now we are predictable. Rettig running changes that. On true running plays adding him to the mix keeps the linebackers from crashing hard on Williams. On pass plays he can keep the chains moving and maybe start to get safeties and LBs hedging a bit -- which would help our receivers later in the game. Finally on dropbacks, if nothing is there, running helps his timing. He should take his steps, scan and then throw or run. The waiting is a killer. Nothing good is coming of it. He either forces a bad pass or takes a sack. By pushing him to run, it creates a rhythm or a natural clock in his head to make a decision. It might not lead to big plays and will probably result in even fewer attempts, but we may become more efficient on offense. Things will probably get worse before they get better. After VT we face the easier part of our schedule. Who knows, Rettig could be fine and start completing passes once again. I still have faith in his arm. I just think we need to use his legs to fix things. Marge Kelley -- the wife of legendary BC Hockey coach "Snooks" Kelley -- passed away over the weekend. There is no online obituary yet, but condolences quickly spread among the BC Hockey community. Marge was instrumental in the success of the program as she served as a mother figure to many of the boys on the team. She has kept a connection to the program through the years. She will be missed. Hockey played Minnesota twice over the weekend. Things looked promising during tense tie on Friday. Sunday's loss was more lopsided. Former Eagle Sean Flaherty wrote an article about BC's social media for MIT. Kenpom released his first ratings of the season and BC debuted 37th. Women's soccer beat Maryland 1-0. This wasn't a game we gave away with bad clock management or a missed kick. It obviously didn't come down to one play. But it was frustrating watching it back, because UNC did not play that well. Not as well as the score indicates. Instead BC kept shooting itself in the foot. This echos what Addazio said after the game, but when he watches it back, I imagine he will have steam coming out of his ears. There were that many plays -- fumbles, bad sacks, defensive players falling down, bad punt returns, etc. -- that added up to a big loss. We have plenty of issues on offense but Rettig is getting most of the blame. In this case it was justified. He is now holding the ball way too long. There were some positives in relation to his pocket awareness. He was willing to tuck and run more than he has all year. And most of the runs were net positives. But too many throws were late or not thrown at all. Talk of making a QB change is very premature. If we are going to make a bowl, it will be with Rettig's arm. I was wrong about Rettig prior to the season. I was really wrong about Andre Williams. He's gotten so much better as the season goes on. The touchdown was nice, but he had a huge hole. However, he had a series of runs between the tackles where he ran hard and moved through traffic. For many years Williams was bad between the tackles. If he didn't have space, he wasn't able to adjust. Now he can weave a bit and is still very hard to take down. The only real issue with Williams was the early fumbled exchange. Rouse got a few snaps in garbage time. Willis was on the field more, but didn't get involved in the offense. The offensive line was good. They got good push on running plays and at different points everyone was asked to pull or run. The pass blocking was also good for the most part. They gave Rettig time on most throws. Patchan allowed a sack, but was good for the most part (despite his penalties). Gallik also let in some rushers. Williams and White both played well. Amidon had a few nice catches but could do much after the catch. He also dropped a catchable third down. But we need to get him more touches. What happened to using him on end arounds? Naples had a nice catch early. Jackson and Evans both had chances to catch balls but the throws weren't great. I blame it a little on them and on Rettig. A better QB-WR connection would have them coming back to the ball. Dudeck missed his one chance at a catchable ball. I don't know what to make of Day's gameplan against UNC. We ran the ball well enough, but couldn't build on the passing game. A big problem in my opinion was passing on passing downs. If we run, run and leave us in a passing 3rd down, the defense knows what's coming. We are at our best when we can pass off of play action or rollouts on first and second down. It worked somewhat early. Why move away from it? Why not use some of the shotgun with short crosses that Rettig and Amidon like early in a possession? Get them in rhythm. Teams are flatout challenging BC now. It is going to be on Day to salvage our passing attack. It wasn't effective this week. The defensive line was probably the best part of the D. Ramsey played well and brought pressure. Appiah made plays for the first time in a long time. Mihalik made some good plays early. Edebali did well closing. Steven Daniels is so much better than he was at the start of the year. We knew he was a big hitter, but he's doing a better job covering a lot of space. Divitto had a better game. He's not getting tackles for a loss, but is tackling well. KPL made some plays early but wasn't as active late. Little had a huge play in his debut. Sylvia was the first BC player to get tossed for targeting and I am okay with that. The replay looked like he was slowing down a bit, but he still led with his head/shoulders without using his arms. If you are really going to break up a touchdown, you need to wrap up or reach in. A knock out hit might get the WR to drop the ball, but that is no longer legal. It will be interesting to see how he adjusts from here. The rest of the DBs had a similar situation from other weeks. They were decent tackling but not great in coverage. Asprilla got burned early turning the wrong way. Williams fell down on a touchdown. The defense wasn't the real problem but the results weren't great. It didn't feel like a Don Brown day. BC certainly brought pressure and generated some huge drive-killing sacks, but most of the time their QBs were given way too much time. Our multiple looks and guys faking the blitz didn't seem to bother either of their QBs. Like I said with Day, teams now know a bit more what to expect. Brown needs to keep mixing things up or just blitz even more. The blitzes were what worked best. Freese's punts were fine and our punt coverage was fine. Freese also had a solid kick off and made his FG. Willis handled all the KRs and was fine. He didn't get a big break on any but made good decisions and ran hard. Spiffy had some issues on the punts. He let one sail way over his head and then had some questionable decisions on returns. Dudeck was fine on his one punt return. The offense couldn't score. The defense allowed long, multi-play drives and the special teams didn't do anything special. Our gameplan was to get control early and grind it out. That was the problem. We didn't have a Plan B. Or at least a Plan B we could execute. We adjusted a little on D by bringing more pressure. On offense we couldn't come up with anything. I appreciate Addazio's candor. UNC probably has more talent, but they didn't overwhelm us like USC did. BC made too many mistakes to win. That happens to all coaching staffs. The key is how Addazio regroups and gets the team to play better. I know there is a lot of focus on Rettig. I've been blogging enough to see plenty of QBs struggle. This is not a Porter-Ryan or even a Shinskie-Rettig. I think this is more like Crane-Davis, where your backups are not the answer. So now the offensive staff needs to find something that works. It is triage time. If they don't, we will have many more games like this. One day we will win in Chapel Hill. Today certainly wasn't the day as BC lost and fell to 3-4 on the season. The defense had its moments. So did Andre Williams. Rettig didn't. There were plays to make but he either missed his targets or took bad sacks. I don't know if he's lost his confidence or trying to do too much, but it wasn't pretty. The good news is that there is still much to play for...all we need is the offense to get back on track. I will have second viewing thoughts and grades late Sunday. Can we finally win at Chapel Hill? Does this start a strong second half of the season? Or do we come back down to Earth? It should be interesting. Leave your thoughts and comments below. I thought Clemson would at least force Winston to play a full game. Only Boston College has pulled off that feat this season. While this may have more affiliates than usual picking up the game, it is still region to region. If you cannot get it at home, check out one of the local Game Watches. Add your Chapter's information if it is not included below. Addazio made a point that we are starting over with the second half of the season. Maybe North Carolina is taking the same approach in the hope of putting behind their 1-5 start. When the schedule came out this seemed like one of our tougher games. Now I don't know. There is still talent in Chapel Hill and they've been in some of their games. Let's hope they don't finally put things together this week. What's on my mind (not totally related to this game) This week proved that the college football community has really short memories. We were a good story after giving Clemson a scare. Then we're off and Clemson gets crushed. Suddenly we are dropping in Power Rankings and a big underdog (considering we are facing a 1-5 team). I don't want pats on the back for being 3-3 but I think BC should win this week and should finish strong. We have our issues, but so does everyone else. 1. Disrupt Eric Ebron's from running his routes. This is the matchup that scares me. Ebron is good. Really good. Probably the best Tight End we will see all year. Our Linebackers (and even some of our Satefies) are not great in pass coverage. My suggestion is blitz heavy at Ebron so that he has to stay in to protect. 2. 3rd down defense. North Carolina can grind it out like we do. If we are going to dictate tempo and be ball control, he have to have the ball. The key is stopping them on 3rd down and keeping their possessions short. 3. Get Willis involved in the passing game. Against Clemson, he proved again that he is good in space. I would love to see a few more screens to him or another wheel route like his first TD. North Carolina is the only ACC we have not defeated as the away team. I could be way off in my assessment but I think Virginia Tech is terribly overrated. I don't think Duke will beat them, but I do think it will be close. We can learn a lot about the Hokies based on how they handle this game. Offensive balance. Addazio preaches it, but we haven yet to really see it on the field. So far one aspect works, while the other trudges along. That shouldn't happen with a good offense. I think we are now at the stage where we know what works and what doesn't. It is on Day to build an effective gameplan around those elements that are working. We don't force turnovers from Williams and Renner. These guys both have the ability to make big plays and keep plays alive. The flipside is the occasional carelessness. We need to mirror our Wake Forest game and get the ball off of their mistakes. I know they're favored. I know we've never won in Chapel Hill. My rational side knows that their "close losses" to VT and Miami aren't all that different from our close losses to Clemson and FSU. Yet I still feel fairly confident about this game. I think we are pretty conservative and avoid critical turnovers and grind it out. Maybe UNC gets a late TD to make the game appear closer than it was. BC wins and sets themselves up well for the second half of the season. Former Heights editor Greg Joyce posted a good write up of the football season at the halfway point. It is a coaching cliche to say we are starting over -- "a new season" -- but this is the one time I agree with the coachspeak. We are starting over. We won the games we were supposed to win and lost to the big guys. Now we have to face real tests against like programs. Finally we will know how good we are. Brian at BCI posted a useful breakdown of Donahue's scholarships. He's right that being so dependent on megaclasses means we will never be consistent. I know this might not make sense, but I hope a few reserves leave this year so that we have a chance to get to roster balance. A transfer wouldn't hurt either. Matt Patchan's brother -- a 2015 recruit -- will be on campus in November. If you haven't noticed BC has been posting most of Addazio's press conferences on Youtube. He doesn't say a whole lot, but I appreciate that Addazio still has good energy at this point in the season. ESPN posted their season preview of the basketball team. Men's Soccer also beat the Crimson on Tuesday. Steve Donahue is one of the best Xs & Os coaches I've seen in college basketball. He is also a good face of the program and a tireless worker. Those issues were all pretty clear early in his BC tenure. The biggest unknown was could he recruit ACC-level players. Four years in we are still asking that question. He's brought in some, but as we face losing Olivier Hanlan to the NBA, the Don's first commitment for the small 2014 recruiting class is way below the radar point guard Matt Farrell. Here's the good news on Farrell: it is highly likely that he is a "preferred walk-on." Farrell hasn't mentioned that aspect yet and neither have the recruiting sites, but I am hearing is that he is. BC obviously cannot make an official comment on it until Signing Day. Preferred walk-on would mean that he is not guaranteed a scholarship, but will get a fair shot to earn one. For a kid with Ivy and Monmouth offers, the chance to play and compete at the ACC level can be enticing even if there are no assurances. I appreciate a player who has faith in himself to compete and succeed. The bigger issue that this raises though is why is Farrell the first guy in the 2014 Class to commit. Donahue targeted a series of elite prospects. We only have one definite scholarship available. Another scholarship is expected to free up due to attrition. Donahue needs a star. A guy who can carry the load after Anderson and Hanlan leave. We don't need another shooter, undersized point guard. Those guys can be found and had at any time. Donahue can pick them up at or around Signing Day every season. Farrell is a proof that those types will come to play at BC even without a scholarship. Guys like Farrell are the role players for a Championship Team. Where is our post Hanlan centerpiece? For a long time I thought this would be a make or break year for Donahue. Then I heard that Bates was on board with the schedule and the direction of the program. BC needs to show improvement this year, but it is not NCAA Tournament or bust. If BC is above .500 and makes the NIT, Donahue will be safe. I like Donahue and I want him to succeed, but I am worried about our future. Hanlan and Odio are his only recruits (so far) who have exceeded their pre-BC expectations. I would say Anderson, Rahon, and Jackson have met. Clifford looked like a steal but we might never see him at 100%. The rest of the recruits have not lived up to their hype. Recruiting is not easy. Skinner missed on a lot of guys and didn't even try on some local stars. Yet he built credibility with BC fans by landing enough guys who exceeded everyone's expectations of what they would be in college (with the biggest surprises being Bell, Dudley, Rice and Jackson). Is Matt Farrell going to be all ACC one day? Will we get one elite player in the 2014 cycle? With the way the musical chairs are playing out, I am not optimistic. Preferred walk-on or not, this is going to be a small recruiting class. Donahue needs an impact player and I hope he finds one soon. Welcome to BC, Matt Farrell. I hope you shut up all the Doubting Thomases and dumb bloggers. Our game against Virginia Tech will be a noon kickoff with a national TV audience. I think this is again a good confidence boost in our TV appeal. ESPN/ABC have not determined which actual network will carry the game yet. That will be decided after the North Carolina game. In other encouraging TV news, our game against UNC is getting pretty good pick up on regional sports networks. The Tar Heels are 1-5 and still a regional team in football, so I don't think they can take credit for the game being shown out West or throughout the Midwest. Surprisingly North Carolina remains a 7-point favorite in our game. I know we have a lot to prove, but I am surprised there remains that much confidence in a one-win team. ESPN has us bowling but keeps us down in the Power Rankings. Olivier Hanlan continues to get great press heading into the season. I know this might be counter intuitive but I don't want him trying to score 25+ a night. I think we will be best if he is getting everyone involved and we are making 3s. If we just stand around waiting for him to do it all, I think our overall scoring will suffer. Women's Ice Hockey beat Yale Saturday. Sunday afternoon they take on Dartmouth. Field Hockey lost to North Carolina. While they remain ranked, they are only 1-3 in ACC play. The Hockey team crushed Wisconsin 9-2. It was impressive in every way with plenty of scoring to go around. It was a fitting win on the night BC honored our Hall of Fame Hockey coach. As many remember "York Night" was scheduled for last season, but the Coach missed time due to multiple eye surgeries. BC travels to Minnesota next week for a two-game series with the Gophers. I'm still pretty sure Chase Rettig and Bryn Renner are the same person, but one's in the DC Universe and the other is Marvel. Why am I not surprised that Ryan Anderson and Olivier Hanlan impressed so many people? Steve Donahue has a roster full of great people. I don't expect BC to be a national title contender next season. That's probably best since the first College Football Selection Committee is a disaster waiting to happen and would never reward BC. I say this because the Committee is filled with old boys network types who are going to focus on traditional powers. The only member from outside the establishment is Condoleezza Rice. Regardless of how Rice feels about strength of schedule or resumes or whatever objective measures one could embrace, she is only one member. I don't see her having sway over the other power brokers enough to get an outsider into the Final Four. My bigger issue is with Mike Tranghese. He's led a lawsuit against BC. Trashed us in the media and has publicly blamed us for the downfall of the Big East. How could that bias not spill over into his assessments? In this sort of four-team setup BC is always in the worse position. We are not a traditional power, but come from a power conference. We cannot coast to an undefeated season like a MWC or AAC team might -- playing just one or two tough games --and then hope for media and public sentiment to get in. Think Boise State or Northern Illinois. Nor will the committee every put in a one or two loss BC team like they might for Alabama or Ohio State. Basically BC will have to go undefeated to ever get in the Final Four. As much as a didn't care for the BCS, at least I knew we could always play our way into the Orange Bowl. We still can in this system, but the Orange Bowl has been marginalized in this process. It is all about the Final Four. My only solace is that we won't be the only program unhappy. This Committee is going to be torn apart. It is inevitable. Whoever is left out as the 5th and 6th team will lead the charge. My hope is that BC will be a title contender by the time the playoff expands to 8 teams and the ACC Champion earns automatic entry. Here is the transcript for Donahue's press conference. He talks about how the starters have grown together. Even with all the optimism surrounding the team, the Media voted us 8th overall in the preseason poll. Alex Dragicevich is in better shape than when he arrived at BC. 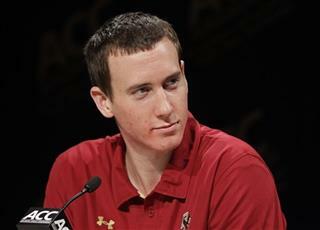 BC put up a twitter roundup of everything from the ACC Media Day. BC's two-game series with Ohio State has been pushed back due to Big Ten scheduling issues. Addazio picked up his early morning practice idea from Oregon. Mike Cavanaugh is adjusting to life running his own show with UConn Hockey. UPDATE: Things seemed to have flipped back overnight. Once again recruiting can be very fickle. Let's hope this commitment sticks. I am a Boston College eagle! PERIOD! One of BC's top recruits changed his mind and has reopened his recruiting process. This is not good news, but I am not losing any sleep over it. Addazio's approach to recruiting and his history leads me to believe that he will bring in enough talent. Landry -- who's profile has only risen since he verballed to BC -- is just one of many. I expect BC will backfill his spot quickly and should have at least 25 recruits coming in this cycle. Addazio's success will be about the whole class and how our staff develops them once they are on campus. Negative recruiting will always happen. Kids changing their minds will always happen. It is just a matter of winning more of these issues than you lose. Tuesday Brad Bates provided his own recap of his first season at Boston College. It was fair and straight forward. Bates admits there is still work to be done. As fans and members of the Boston College community, I think we can look back on where we were and identify the big challenges ahead. The most important change in Bates' first year was firing Spaz and hiring Addazio. The Spaz portion was practically predetermined. Any new AD would have done the same thing. The only issue was if Bates should have fired Spaz midseason. Despite calling last year a waste of time, I don't think getting rid of Spaz would have benefited anyone. In fact it might have just created more recruiting issues or a temporary shot in the arm that might have pressured Bates to promote the interim to the full time job. Regardless of how you feel about Addazio, would you rather have Head Coach Doug Martin or Head Coach Bill McGovern? Some might argue that Bates could have got a jump on the head coaching search by firing Spaz earlier. I don't think it was a factor. Based on who we talked to and the type of candidates we approached, more time wouldn't have made much difference in the end result. Addazio looks to be a decent hire so far. No one will really know if he was the right long-term choice for a few seasons. Short-term he has provided the energy and enthusiasm that the situation needed. The other looming issue when Bates took over was our place in the conference landscape. Last fall the ACC was still vulnerable to another raid and there was doubt if the conference would be part of the new playoff. Now through a series of moves made by other people, BC is safe. The ACC is not going anywhere, the conference is better off financially and BC has access to the postseason. Although Bates wasn't a key player in those moves, he didn't screw it up. Going forward he will still need to politic and position BC for future dominoes, but I don't think anyone expects something happening in the next year. Once the playoff begins and the 5th and 6th team are left out, this issue will bubble up again. Facilities and fundraising are constants for any AD. BC is about to enter another multi-year renovation project. I don't know Bates' style when working with other departments, but I hope he gets all of the major Athletic Department projects moving forward. BC's current offerings are not up to ACC standard in any ACC sport. Bates best asset on the fundraising trail is that he is not Gene. There is no baggage and his approach is very different. By the nature of the job he has and will continue to rub some the wrong way, but overall I think he has been well received. From what I gather there is a similar feeling among BC staffers. Most like him but there are a few that don't. Bates also needs to build on his early Marketing initiatives. But the best way to sell BC is through winning teams. As far as coaching issues, there are three looming. The most obvious is baseball. I have very little hope for a turnaround this year. When the decision is made, I hope Bates has some good candidates lined up. For all the limitations BC baseball presents, we can still be a lot better. Most think Donahue has at least another year and will probably get more if we succeed this year. But if things do fall flat, Bates will have to assess Donahue's status. Finally, there is Hockey. Jerry York's health scare was reminder that he is not going to be BC's coach forever. Bates probably won't have to make a decision this year, but he should prepare for how he wants to handle it when it comes. I don't think Bates will be BC's AD as long at Gene was. That's not because of anything he's done, just more about how the nature of these jobs have changed and the changes facing BC. We will probably have a new University President within the next four years and that will have a ripple effect on major departments like Athletics. Ultimately Bates will be judged by how his coaches do and what he does with facilities. Based on his first year, I think Bates is taking us in the right direction. Some of football's most revolutionary offenses were happy accidents. Bill Walsh's West Coast system came out necessity when his big armed QB went down and he needed to adapt for a weaker but more accurate Ken Anderson. Rich Rodriquez's read option spread came about after a QB and Running back screwed up an exchange in practice while he was coaching at Glenville State. I don't think Addazio planned to create a new offense when he came to BC, but maybe our circumstances and the early results are reason to keep doing what he's doing. Addazio has been pretty forthright that BC is not currently running the offense he would want. His ideal is something similar to what he had at Florida with some Chip Kelly influences. It would be a run-first, uptempo spread with a mobile QB. When Addazio took over he realized forcing his desired scheme on a roster that wasn't recruited for it would cause some unnecessary pain. So instead he and Ryan Day took elements of their offense and molded it a bit with BC's current roster and added some power running, jumbo packages that Stanford put in under Jim Harbaugh. While BC is not lighting up the scoreboard, there is certainly more efficiency than we ever saw under Spaz. It is working well enough considering it was only designed as a transitional offense. 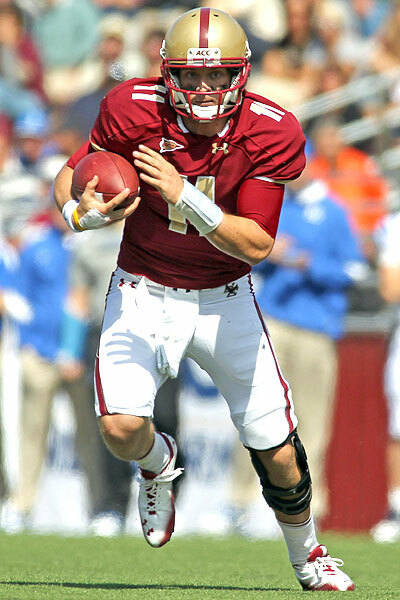 Next season BC will have a more mobile QB, hopefully a few more playmakers and an improving offensive line. We should start looking like Florida did when Addazio ran their offense. It will be our own but many of the concepts will be like fellow ACC spread teams FSU, Clemson, UNC, Louisville, and Wake Forest. Those shared concepts with half the conference are my concern. BC won't be unique in the future making it easier to prepare and easier to gameplan against. In any sport there is an advantage to being different. Think of the problems caused by Triple Option teams like Georgia Tech. Their opponents are not used to playing them and that can make up for talent differences or other weaknesses. I bet Georgia Tech's unique scheme gives them at least one extra win a seasons. This year BC's differences are creating some of the same problems. When we go into our big packages and/or unbalanced line, teams have to decide how to defend it. It creates mismatches. And even once teams have seen it, we've started adding wrinkles (play action, straight drop backs, late releasing players). If BC were to keep playing this style there are many more wrinkles to add that would keep our opponents guessing. Having a dual threat QB will also create new opportunities in this offense. Think of how effective naked bootlegs will be with a QB who can run if needed. But being unconventional isn't the only reason to keep an offense. I think we can recruit to it. BC has always been able to find, recruit and develop big offensive lineman. Our trackrecord with Tight Ends is underrated, but I think we've done better with Tight Ends/H-backs/Fullbacks than we've done with elite WR recruits. I would also argue that our history of recruiting and finding running backs is good. The one area on offense where we haven't brought in a lot of elite talent nor sent any to the NFL is Wide Receiver. These playmakers -- who may be a bit undersized but have plenty of speed -- are the key to Addazio's ideal offense. Speed is also a big deal at Oregon. I am not trying to say we can never do something or perpetuate regional or racial biases but where do you think BC can recruit elite players: Tight Ends or WRs? I also like mixing the Stanford Offense with the Spread because it doesn't make BC one dimensional. If recruited well and practiced well, we should be able to grind it out or get into pass-happy shootouts. The offense hasn't been revolutionary enough for any to take notice or probably even get people in the Yawkey Football Offices thinking differently. Maybe next year if we struggle, Day or Addazio might say, "let's break out some of that power stuff we used last year" or "I think our unbalanced line would work against this team." I hope our finish to this year is strong enough that they realize what they have. Who cares if it is new or a mix as long as we can make it work? The Hockey team quickly bounced back from their disappointment in Michigan to thrash RPI 7-2 at Conte on Sunday. Seven guys scored and Demko had 25 saves. The team faces Wisconsin this Friday. Even with our impressive showing, AA and HD still don't have us bowling. I am not worried. If we get to six wins, we will go somewhere. And doesn't everyone feel pretty good about our chances to get three more wins? You might have missed this last week, but CBS's Jon Rothstein was at Basketball practice last week and tweeted out a series of quotes and observations about BC. Donahue had a lot to say. It is worth scrolling back through Rothstein's timeline to read the entries. This isn't BC-specific but I thought TCU's attendance issues should be on our radar. The school has had BCS-level success lately and renovated their stadium, but remains a private school in a big Metro market. I don't know if there is a specific lesson for BC, but I don't think we should expand capacity when we renovate Alumni. Watching the game back was encouraging and frustrating at the same time. Our defense is solid. Sure Clemson didn't play their best, but our D was a real source of frustration for them. Plus the D as a whole is getting better every week. In my review it may come off like I am defending Rettig. That is not my intention. We needed him to have a great game and he didn't. But watching it back did make me realize that many of his late game issues were the result of successes he had early. Like Addazio, I am not happy with the loss. We had a chance to win and blew it. And that is reflected in the overall grade. But I do feel like we are actually building towards something. Early in the game Rettig made multiple plays by scrambling or moving in the pocket to keep plays alive and keep drives alive. Later in the game it obviously came back to haunt him. The fumble was really bad. He's also got to avoid sacks. He's still a little too hesitant to make throws in tight coverage. Our guys aren't getting "open" but there are plays there. Rettig needs to get rid of the ball faster. I don't know the dynamics huddling late. I don't know if he is following orders, but Addazio was admonishing him to move faster and he didn't. It was a good start for his day and a bad end. He needs to play better. I thought Williams ran hard. He was their key and they loaded the box, yet he was still getting positive yardage. There were no explosive plays but it was solid. Willis' TD was a great run on his part. He made a good cut, outran people and stayed inbounds. He was bottled up on most of the other plays. There was an option play where he got a late pitch, held on and got pounded. He's tough. Sinkovec looked good on his pass. Amidon had the big game I hoped for. He caught tough passes and ran away when he got the chance. I wish we were forcing it to him more. The Tight Ends were fine. Spiffy looked good and the holding call on him late was borderline. This was somewhat typical of this Oline. The run blocking was good and the pass blocking wasn't. Vardaro played the best. Gallik probably had the roughest day. He let guys dart by him and also got pushed around a bit. Patchan struggled a bit on the pass coverage. White was fine. Williams was good. I am okay with the play calling. It is conservative, but we do build on plays like the play action, the counter and the bootlegs. I liked getting the ball to Amidon on runs (you have to get it to your playmakers). My biggest problem is how we approached the 4th quarter. Regardless of where the blame falls (Day, Rettig, Addazio, all of the above), we didn't execute a good "two-minute drill." That's on the OC. Ramsey had a good game. Gutapfel made a play. Edabali was good and looks so much better now that he's allowed to move around. Wujciak played well and was able to get consistent penetration. KPL had a nice day and made big plays all over the field. Daniels looks so, so much better than he did in the beginning of the year. He's a solid tackler, hard hitter and in position make plenty of plays. Divitto was fine. The DBs as a group are played well and are much improved. Sylvia's bit hit caused a fumble. Asprilla made some solid tackles. Bryce Jones looked really good. Williams was good. Rositano -- who I've been tough on -- broke up a pass. ALJ was the guy who got picked on a bit, but he was going up against the best. Brown called a good game. As I've said before calling a game is a bit like Rock-Paper-Scissors, but what I appreciate about Brown is that we are showing different looks and keeping them guessing. We didn't blitz much early and then did later. Plus we got pressure in the backfield naturally. We got beat a few times by their skill guys but I feel like our players have a good understanding of what they should do and are making good plays. Freese was good on kicks and punts. We missed one key opportunity to pin them but it didn't mean much in the scheme of the game. Spiffy and Willis both did well on their respective returns but didn't break anything big. At least they were aggressive. Clearly Addazio had the team prepared. The early gameplan worked well and the team seemed confident and willing to fight. The play I was most proud of was the Amidon TD. Clemson scored and we answered quickly. It was a huge moment and had me believing we would win. Good teams answer scores. But it wasn't enough. The bigger issue was Addazio's use of the timeouts and clock management. As Austin Tedesco pointed out, Addazio's actions show that he's not concerned with preserving timeouts. Found while working on a BC football piece during layover: BC has only entered last 5 minutes of one half this season w/ all 3 TOs left. There are two schools of thoughts on timeouts. One is to use them whenever they are needed. The idea is that execution of a current play is more important than preserving time later. The other philosophy -- especially in a close game -- is that you don't burn them and only use TOs later in the game to maximize your possessions. Despite our scores yesterday, we are not a quick strike offense. Our current approach is to grind it out. With that mindset, sustaining drives becomes critical, so you can rationalize using them. If it becomes a trend with Addazio and costs us games, then I will readdress it. The other game management issue was the lack of hurry up and the punting. This is another case where I will give Addazio the benefit of the doubt. Clemson is not a clock killing team, so punting and playing for possession when you are still within two scores makes sense. And as far as hurry up vs huddling, it wasn't a good idea, but I also think it can be explained by trying to execute rather than rush, just to save clock. If Spiffy's not called for a hold, Amidon's end around puts us just outside of the red zone with three minutes and down ten. Score and then try the onsides. Overall, the game was a loss so I cannot give a great grade. But I remain encouraged. BC played great for nearly three quarters. But too many mistakes and not enough big plays led to Clemson escaping with the win. I am not despondent, but I am also not happy. This game was in our grasp and things started to fall apart. A big part of that was on Rettig and the OLine. But I didn't love how Addazio managed the clock. I assume he will justify it by saying that executing took priority over tempo. But overall there was a lot of positive takeaways. We can play with anyone. Death Valley has been the scene for some of my favorite BC games (2005 and 2007) and some of the most painful (rain delay in 2009 and the onesided game in 2011). Let's hope this one falls into the great moments. Leave your thoughts and comments below. This is yet another game in a featured national TV slot, so you shouldn't have to scramble to find a place to watch the game. However, it is always better with other Eagles. Join your local Game Watch. If your Watch is not listed, post the information in the comments section. 1501 Spruce Street Philadelphia, Penn. 602 Broadway San Diego, Calif.
1207 19th Street Northwest Washington, D.C.
Addazio asked what it will take to give Clemson a game the way they did vs FSU: "Our goal is not to stay in it, our goal is to win it." Pat Dye laments Condi Rice not being qualified for Playoff Committee. But he's OK w Mike Tranghese who only played golf at St Michael's? Your fearless author has a slap bet on the line regarding if Chase goes drafted or UDFA. This will not end well. Prior to the season, most identified the first half of the schedule as daunting. 3-2 was somewhat expected and predictably we are heavy underdogs against Clemson. Now that the game is here, I have a little hope. The Florida State game and USC games exposed BC's issues, but they didn't do anything to kill my belief that we can compete during the second half of the schedule. And I don't think the Clemson game is going to change that confidence in the team or the fanbase. It is a bit like playing with house money. If we lose big to the Tigers, it is not big deal since we were underdogs. If we hang with them but lose, it is a moral victory (acceptable only in 2013) and if we win, it is a huge statement game for Addazio and the team. What's on my mind (not totally related to this game)For years I've been saying that if the Notre Dame series goes away, that the Clemson game should become the student road trip. The Notre Dame series didn't go away totally, but it seems like I wasn't the only one preaching about a Clemson trip. There are student RVs heading down to South Carolina this weekend. I don't know if the game will be great, but the tailgating and trip should be fun. Of course this will be the first BC game at Clemson that I will not see in person (dad stuff) and I will miss it. Current and future students: make the trip to Clemson if you can. You won't regret it. 1. Get good field positioning on Special Teams. Our Special Teams have been much improved the past two weeks. We need to keep it up. If Willis and Evans can help flip the field, we may be able to hang in a shootout. 2. Get Williams involved in the passing game. This will help break tendency. The whole stadium is expecting him to run it. So use him on swing passes or delayed wheel routes. 3. Don't allow any big plays. Everyone's scored big plays on us. Villanova and Army included. I don't long for the bend but don't break days, but if we want to win, we have to cut down on the other team's explosive plays. Even though Clemson has controlled this series lately, BC still holds the longer win streak between the two schools at four games (which included our first three matchups as ACC members). Syracuse at NC State is probably most relevant to BC fans. Both are future opponents and both have been inconsistent. Once we get out of this stretch our season will really be determined by how we perform against similar ACC teams. How they perform against each other might give us an idea what to expect. Amidon have a big game. Obviously that is a key to winning, but I think he personally needs a big day against an elite team if he wants to get drafted. There is always going to be a bias against his stats based on our record and our lack of other playmakers. If Amidon wants to become the first BC WR drafted in three decades, he needs to start showcasing his ability to get open and make plays against the best. the Offensive Line cannot control the line of scrimmage. That was the biggest difference between the lopsided USC game and the respectable FSU game. If Clemson guys are blowing up or darting past our linemen, we won't score much. As much as I would love for Clemson to "pull a Clemson," I just don't see it happening. They're too tested at this point and there is too much film on us for them to be surprised. I think we try a similar grind it out approach like we used against USC. We'll be more effective moving the ball, but cannot keep pace with their explosive plays. BC finally got approval for a new dorm on Comm Ave. As most know, it has taken nearly a decade to get this far. While this is big news for students -- and means fewer will live off campus -- it also has huge repercussions for BC Athletics. Once the dorm is built, BC will then be able to renovate other buildings and create some new athletic fields. 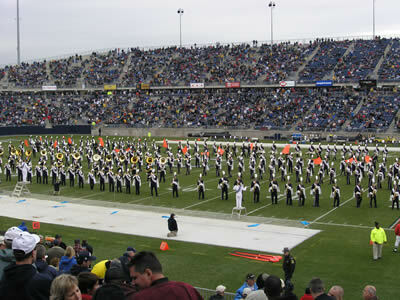 The Athletic fields were specifically mentioned in the approval and in the article. However, BC didn't announce the order or priority of the new athletic buildings, but you have to assume the Plex is high on the list. My hope is that any Plex renovation will include some sort of indoor space for Football. I also hope this leads to a true baseball/softball complex. Bates was scheduled to reveal the Master Plan this summer. He didn't. I assumed it was related to the dorm approval. Now that BC can go forward on that front, I expect some clear plan from Bates to follow. Should Dabo be Addazio's role model? I've underestimated Dabo Swinney from the start. The accent and name didn't help, but I never understood promoting a Bowden staffer and didn't think much of Dabo's first few years. I thought he was a terrible play caller and game manager and found his "rah rah" stuff grating. Now Clemson sits among the best teams in College Football and comes into BC a 24-point favorite. Clearly Dabo is doing something right. It all seems to go back to losing at BC to a mediocre Spaz team in 2010. After that Swinney removed himself from the offense and went out to hire the best coordinators he could. He kept himself heavily involved with recruiting and let the coordinators own their sides of the ball. Swinney's gung-ho persona always played well with recruits, but rededicating himself to recruiting kept the pipeline full before anyone knew if Chad Morris's offense would work in the ACC. Since then, Clemson has gone on their best run since the Danny Ford days. Dabo -- despite my skepticism -- seems to know what works for him and Clemson. Despite the different backgrounds and different jobs, Addazio and Swinney have a lot in common. Both wear their emotions on their sleeves. Both seems to love recruiting and both have been criticized for their play calling. Addazio avoided one of Swinney's first mistakes by not being his own playcaller or co offensive coordinator. He influences the process but it is Day's game. Addazio also realized he needed an ace defensive guy before he joined the ACC, so he hired Don Brown. That's where BC benefited from hiring Addazio after he had gone through coordinators and been a head coach at Temple. Swinney learned those issues while on the job. Where Addazio has yet to meet Swinney's success is on the recruiting trail. Early returns are promising, but Clemson's been doing it for a few years. Hoffses wasn't the only one to come away impressed. Last week Jay Bilas was on campus and supposedly liked how the team is coming together. We know our nucleus can compete. If they improved from last season, we get a spark from the new guys and have a healthy Clifford, we can play with anyone in the ACC. I don't know if the final score or even the mood during the game captured BC's effort on Saturday. When I watched live, I was tense and kept waiting for the other shoe to drop. When you watch it back -- knowing the outcome -- the defensive issues become less frustrating and you can appreciate how good the other aspects of the team were. Our style of play wasn't an NFL showcase, but Rettig played really well. Although he is not a runner, he doesn't look terrible when he does keep it. He also looked good throwing on the bootlegs and rollouts. His passing in general was very sharp. I also like that he was still able to make plays on the quick outs to Amidon (which I assume are his call to make at the line). It shows good decision making and understanding of the offense. Other than tripping over his own feet right outside the endzone, Williams was great. He's much better in traffic than he used to be and still has good speed in open space. I also appreciate how hard he's running. Not only is he pounding tacklers, he keeps doing it on carry No. 28 just like he did on his first. Willis had a few nice runs and is providing a nice change of pace. As you would expect with a record-tying day, the OLine was great. Because of our huge size advantage we we able to get our lineman totally released and pulling deep into the second level. Patchan, White and Williams all looked good pulling around the ends. I don't know if we have the stars on the line yet or if the USC game was just an anomaly, but our OLine is playing really well as a unit and this was their best game. Amidon's running away from tackles and through traffic was impressive. Even end-around show that he can make something out of nothing. Spiffy made a nice catch on an underthown ball. He also did a good job with running after the catch. Dudeck made a nice grab on the TD and got a hand on a tough throw later that he didn't pull in. I am glad Jackson was targeted but it was hard to read much into it. The Tight Ends were strictly blockers and decoys as none were targeted. It is hard to nitpick on a 48 point day when your running back broke records and your QB only had two incompletions (one of which was catchable). I thought the gameplan was solid and the play calling also good. Our only stalled drives were really about a few penalties and execution issues. I also appreciate that Day likes to go back to plays that work. It is a simple philosophy, but you might as well keep running something until the other team proves they can stop it. Steve Logan often did the same thing. Mihalik had one of his better days. He was able to keep his assignments and still make some nice tackles. Edebali was good. Army had good success on the middle dives but it wasn't really the fault of BC's DTs. Wujciak was fine. He didn't miss as much as Army did a nice job opening up small creases in the interior. We also used a lot of three-man fronts so there wasn't as much for these guys to do. KPL looked really good early. There were a few plays where Army ran away from him and he still caught the runner. Daniels has really improved from the start of the season. Keyes wasn't as sharp on the option plays his way, but still made some nice tackles. Divitto was good. Asprilla was really good breaking up the option and made some nice tackles. Sylvia covered a lot of space and was solid tackling. Williams got a lot of time in place of Rositano but wasn't as active. Jones was good. Army didn't pass as much as they did last year, but our coverage was much improved and other than the flea flicker, there weren't any real coverage breakdowns. We went vanilla (for us) and did enough to win. That's what matters on defense. But I still don't love giving up so much yardage and so many points to Army. The good news is that the guys were prepared for Army. They flowed to the action and played their assignments. Special Teams looked good -- and have most of the season. Freese was perfect on his FGs and extra points. His punting was better and he put nearly every kickoff into the endzone. Spiffy had a nice return on a punt and Willis was explosive again. He's providing a spark, but he's also getting good blocking. Other than Dudeck taking an accidental knee, it was a perfect day on Special Teams. Temple played Army in both of Addazio's seasons there. He referenced that experience and the quirkiness of playing the Cadets in his post-game comments. His main point was you need to establish the run and run all day because these games often become a matter of holding serve. Army is not going to score at will but if you don't overpower them and rely on a mediocre passing game, it can turn into last season's disaster, where a team is pressing late, not using the clock well and allows a late Army score. It was an candid assessment gives you some insight into why this game matters. I think maybe we underestimated Addazio's game preparation and game management skills based on his reputation. He's not calling the plays here, so that isn't an issue. Instead he's leading and setting our philosophy game to game and adjustments. And so far, I think he's done well. Did our defense dominate? No. But they did enough. When you do so well in Offense and Special Teams, one area can be just okay. And because of his experience, Addazio set the tone for this week and the team went out and executed. Under normal circumstances, Army shouldn't really be a test of anything or an indicator of anything. We weren't normal or stable last year, so I have to use it as progress. Let's hope that as long as Addazio is around Army is never an issue again. It took a half to adjust to Army's option, but once we got the hang of it, BC controlled. The player of the game was obviously Andre Williams, who tied BC's rushing and TD records. Overall the offense played very well throughout and just overpowered the Cadets. It is what we should always do against Army. The win was BC's third and already surpasses last year's total. Last year the Army game was memorable for all the wrong reasons. Let's hope this year is different. Leave your thoughts and comments below. You can also follow me Twitter. Men's Soccer lost to No. 8 Maryland Friday. The loss moved them to 2-2-1 in ACC play. CJ Parsons got the Globe treatment. I am glad things worked out for him. I never understood why Spaz didn't take more Northeastern transfers. I know they weren't elite players, but some of their upperclassmen might have helped our depth and only cost us a scholarship for one year. If you get a chance read the Herald's write up of the Emerald Isle Classic against Army. I cannot recall the last time a Boston paper did a special section on BC sports. The men's basketball team named Ryan Anderson and Joe Rahon team captains. I hope that failing to elect Dennis Clifford again has nothing to do with Clifford's potential availability this season. Volleyball lost to NC State. This is an ESPN 3 game so your regular sports bar might not be all that accommodating, but there are still plenty of BC-friendly bars around the country ready for our fans. If your Game Watch is not listed, just add it in the comments section. If UConn wants to troll the hell out of BC fans they should hire Jeff Jagodzinski as their next head coach. I can't imagine many more excited than me that college hoop practice has begun. I believe this will be a special year for @BCHoopNews. As I've mentioned, I don't like when politics creeps into sports. Too often people try to exploit people's passion for one into their desired outcome for the other. I use sports as a distraction. Selfishly I am glad BC's playing this weekend. I am also happy for the players on both sides. They only have so many games in their careers. They should cherish each one. Brad Bates was hired right after last season's Army game. In hindsight it was probably best to start when things truly bottomed out. It is still to early to guess how his tenure will play out but I am encouraged by Bates' baby steps. While I didn't love the Addazio hire, there is no doubt that our preparation and approach to football is vastly improved. Spaz couldn't get the team ready for Army. I don't think that will ever be an issue for Addazio. 1. No long plays. If an option team beats you with 60 three-yard plays, there's not much you can do. However, allowing them to break big plays is unacceptable. Last year Army killed us with big runs. It is on our DBs to support and run down any breakaways. 2. Get others involved in the passing game. I expect Army to load up the box to stop the run. Rettig should welcome that and be able to get off multiple big passes. I also want to see him get it to some of the other receivers. 3. Get penetration on the defensive line. This is where the loss of Abdesmad hurts. But our other guys up front should be able to dart in and throw off Army's run game. Last season's loss snapped a five-game win streak against the Cadets. The longest streak in the series is nine-wins. Army won the first nine times the teams played and BC won nine straight from the '80s to the '90s. Maryland-Florida State is a biggie. Both teams are ranked and undefeated. I am curious to see how the Seminoles respond after our game and I am also curious to see how good our future opponent Maryland looks. BC build up enough of a lead to let Josh Bordner play. I usually write something similar when we are heavily favored, but this year it has a bit of a different meaning. Bordner is closer to the prototype Addazio-Day QB. Even in mop up time, his play might give us a glimpse into the future of our offense. We don't force bad pitches. Last year our defense was always about containment. This season is about pressure. You saw it in the Wake game where we had them flailing around on their option pitches. We need to be even more disruptive against Army. If we're not, it will be a long day. This won't be a repeat of last year. I think we will be better prepared for their attack than we were last season. I also think we will control the clock and scoring. Plus the distractions from the shutdown will impact them somewhat. Army missed a practice this week. BC did not. Maybe Army gets a late touchdown to make the game appear less lopsided, but BC wins easily. As expected BC will play Army as scheduled. The Department of Defense approved the game Wednesday night. Cancel those plans to go apple picking. ESPN says the game will take place Saturday. BC is saying no decision has been made. Boston College confirms that no decision about the game has been made yet. Nothing is official until Thursday at noon eastern. As I've written before, I think the game will be played Saturday. That's what BC and Army both want. His first goal would be to get the Army game back on schedule. This minimizes ticket refund issues and complaints about donations and parking spots. The most likely day to play this game would be December 7. However, he would have to have a wink-wink, contract in pencil agreement with Army that if BC somehow won our division and made it to the ACC Championship, we would get out of the Army game altogether. I don't think we are going to make the ACCCG, so if we don't play this weekend, this is probably what will happen. He needs a contingency though if the shutdown lingers. Who knows how this will play out and if the service academies will even play football once they start missing multiple games. If that happens, multiple schools will be looking to makeup for lost games. I am guessing that BC would try to arrange a last minute game for December 7 with one of those teams. The most logical replacement would probably be Temple. Their October 19 game against Army is in jeopardy. We are a relatively inexpensive trip and there is enough familiarity among the staff and teams that it wouldn't be too daunting to prepare. The only issue might be bad blood over BC poaching Addazio, but Temple could probably be talked into it. And if they won't play, Bates just needs to work the phones to find another team out a game. If a game cannot be found, BC needs to push hard for a bowl waiver. A forfeit might be more official, but who wants a fake W due to a shutdown? The high road would be BC not taking a win and just asking the NCAA to allow us to attend a bowl game if we get to five wins. We wouldn't be the first exception. And as 13-point favorites, I think we could successfully argue that we lost a very likely qualifying win. I tend to mock UConn whenever I can and revel in their woes. Grudges will make you do that. My disdain goes back to Calhoun's condescension, but really manifested itself when the State of Conneticut sued BC during the ACC expansion. I want nothing to do with them as a sports program and really cannot get enough of bad things happening to them on the field. As with most grudges, this stance is not healthy and not supported by logic. UConn is now in the process of finding a new coach, and as a BC fan, it is probably best that they hire a decent one. There are a couple of reasons why a decent UConn program is good for BC. The first being that it raises interest in football in New England. The region will never be Florida or Ohio or even New Jersey as a source of talent, but there is still room for the sport to grow. If Connecticut is a joke of a program, fewer kids attend their camps, fewer dollars are put into football, media perception takes a hit, etc. If they are consistently above .500 and going to lower-tier bowls, their expectations and success will help football develop. I also want UConn to hire a young coordinator because that guy could end up being a good BC Head Coach. Let them be the place where a coach learns how to build a program, recruit players and manage games. Then one day, if BC needs to hire a new coach, there could be a perfectly acceptable candidate who knows the region right down the road. Think of it like another Randy Edsall. We never hired him but he was always there if we needed or wanted him. Finally, there will come a day when it makes sense to play UConn in football. The travel expenses are minimal, there would be interest and we will need games against mid-majors. A win over a decent UConn would help more than a win over a terrible football program. I will always have enough animosity against UConn that I don't want them to be great. It kills me that they played in a BCS game before us. But having them as bottom-dwellers does nothing for us. What we need is for them to hire another Randy Edsall. Then once he has some success, we can sit back and enjoy the Huskies fans getting all riled up anytime someone speculates that their coach might want to be at BC one day.